Can be found in corrupted areas near Twilight Hammer NPCs. 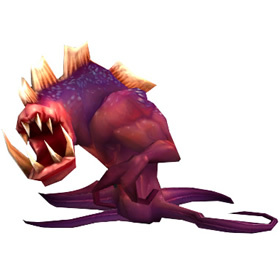 Due to heavy phasing mechanics in Twilight Highlands, players may need to travel to multiple spawn points to check if they are properly phased in to see this wild pet. This is kind of an oddball, but i like it. I used my P/P with Rake, Leap and Siphon Life, which is a weak ability set, but combined with the 341 power and Magic racial, it lasts surprisingly long and it is very disruptive. H/H or H/P might be more suitable for it, but i didnt catch one of those yet. Several of these around at 11:59pm today server time (Dalaran). I've only done 4 quests in the zone. All were poor quality, I'll come back later and try for better. Comes in a nice P/P breed with 341 power. With the buff to Adrenal Glands, no more minus to hit, this guy can chew some serious face especially humanoids. Leap is nice if you need speed, even if it's just for one turn. While Creeping Ooze is one of the strongest dot's right now, will also be affected by Adrenal Glands crit bonus making it hit very hard. Creepy Chomp crits for about 500(600 if P/P) on non humanoids. Hard hitter but cant really take any punishment. I couldn't find this guy at all with my main or one other. I decided to check to see if there was a phasing issue. Sure enough the one toon I have finished TH quests with could see these. Couldn't find a rare but uncommon works for me. 7:15pm Mountain time. I got my rare at 315am Zangarmarsh time or 515 am EDT after returning an hour or two later. At first there were only two and poor quality. The 2nd time, about six or so. Rare on 3rd try right in the middle part down below of the star shaped crack in the earth, right in the center of Twi Hi. I hope you get him on your first try :) Thanks for comments so I knew where to look! Followed the suggestions of clearing/battling other bps in the areas and it worked. On a toon that just started questing the zone, I flew around and battled spiders and roaches and one finally spawned at the devouring breach (turned out to be a rare). Thanks for the tip - there's none to be seen, start battling the spiders and roaches in the Twilight areas. This was about 8pm server time, Terokkar. Got myn after fourth try. 12:28 a.m. US-Malfurion at The Twilight Breach, 39,46. There were two, but both poor quality. Each level 23, and accompanied by a level 23 Highlands Turkey and a level 23 Water Snake. Found 2 in the devouring breach. I have never taken this toon to Twilight Highlands before. 3:13 am server Vashj. Spent about an hour and was rewarded with my Rare "Phyllis" she is named after my Mother-In-Law. I'd like to point out that Breed #4 of this guy is a pretty awesome battling companion. Leap with such high attack power is amazing, and Siphon Life helps keep him sustained. First try a rare at the The Twilight Breach. Went 2 wks ago & cleared spiders & roaches from the twilight area SW corner, then saw 1 spawn at Devouring Breach right after. I accidentally killed it. Went today at 6:30 pm central & cleared out spiders & roaches at Devouring Breach, & 1rst spawn was a rare. :) Just clear them out & stay put til one spawns. Shouldn't take long. 7:30 am Bloodhoof time. Found around east from CoC. Was down in the purple glowing area or on the ground right beside. I couldn't find any so I took my character than had finished Twilight Highlands out there and ta da; there they were! If you are having this issue I suggest switching characters because of phasing. I'm sure we remember how frustrating farming twilight jasmine was/is. will use a blue stone when i get one when i can to upgrade it to a rare eventually. good luck. Got my rare on the second one. They seemed to be all over all 3 spawn areas. Got a bunch of other rares off them and spiders as secondary pets in the battles. 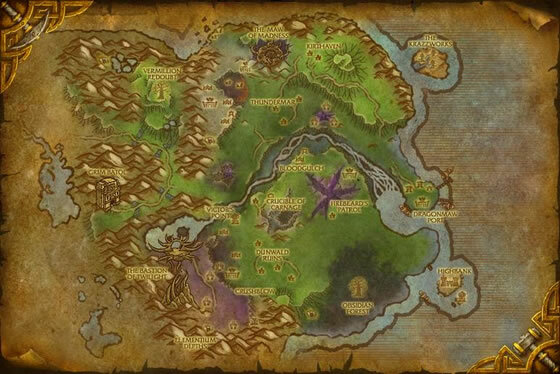 Take a character that hasn't been to Twilight Highlands to the Devouring Breach, very few mobs and lots of Twilight Fiendlings visible. No phasing issues. Demonstrating that a little evil goes a long way, this fiendling uses its razor-sharp teeth and gaping maw to devour anything in its path.